The objective of eCITES is to improve the implementation of the Convention by using modern Information and Communication Technologies to simplify compliant trade and to combat illegal trade. The purpose of this Workshop is to foster the collaboration between the CITES Management Authorities and the Customs Administrations for improved control of trade in wildlife. The Workshop promotes a common approach of the CITES Management Authorities and Customs Administrations based on modern and automated trade procedures and Customs clearance processes in line with the requirements of the WTO Trade Facilitation Agreement which came into force recently. Participants will be familiarised with the specific integrated Customs border controls, automated and simplified procedures, new technologies and their use to improve the controls for trade in CITES listed species, in particular with regard to electronic information management and exchange. The Workshop is open to interested decision makers and individual experts from CITES Management Authorities, Customs Administrations, logistics and transport operators and International Organizations. Governance: The Convention, through its Working Groupon electronic Systems and Information Technology provides standards for eCITES implementation and ensures that Parties can take advantage of modern eBusiness approaches to implement the Convention. Tools: The Working Group and the Secretariat publish standards and tools that support parties in the implementation and foster compatibility and information exchange of eCITES systems. Implementation: The secretariat provides advisory services and capacity building to Parties. It works with a technology provider to provide Parties with low cost and off the shelf solutions such as the UNCTAD eCITES system. With decision 17.157 the CoP requests the Standing Committee to re-establish the CITES Working Group on electronic Systems and Information Technology. The Working Group will be established on the 69th meeting of the Standing Committee (27 November – 02 December 2017, Geneva, Switzerland). The Working Group in close collaboration with the CITES Secretariat will revise existing documents and develop new standards and tools. This work is done in collaboration with UNECE (UN/CEFACT), UNCTAD, the WTO, WCO, IPPC, UNEP and other relevant partners to ensure integration of eCITES into the global agendas. To prepare the first meeting of the Working Group a draft work programme and a number of background documents have been circulated to the previous members of this Working Group. Parties interested to participate in the Working Group should contact the Chair, Mathias Loertscher, Head CITES MA Switzerland. The 1st meeting of the Working Group on electronic Systems and Information Technologies will be held on 29 November 2017 18:30 to 19:20 ICC Room 5 in Geneva, Switzerland with this draft agenda. The CITES ePermitting Toolkit was developed by CITES Secretariat and the Working Group to support Parties in the implementation of electronic Permitting systems. The first version was presented on the CoP 15 (Doha 2010). The Annex of the CITES electronic toolkit was updated in 2013 to include new electronic permitting standards and norms developed by UN/CEFACT and WCO. The first three chapters of the Toolkit provide background information on the use of electronic Business solutions for CITES permitting. Readers should be aware that since its drafting in 2009 eBusiness technologies and practices have considerably evolved and the topics in the three chapters do not reflect these changes. The CITES Working Group on electronic Systems and Information Technologies will review important topics, for example on the use of signatures and seals in electronic permits and address them in specific papers. The Annex of the Toolkit contains the normative part of the Toolkit. It provides a data model and the message specifications in UN/EDIFACT and XML format for electronic CITES permits. The message formats are given in the UN/CEFACT Core Component Library (CCL) standard (ISO 15000 suite of standards) and in the WCO Data Model standard. The Schema for the electronic CITES permit (toolkit version 2) can be downloaded here. Parties can use the eCITES validation Web Portal to validate a CITES XML permit against the CITES Toolkit Version 2 XML Schema. The service is provided out of courtesy by GEFEG GmbH Germany. The eCITES Implementation Framework provides national project managers with a best practice approach to plan and manage the automation of their CITES processes. A standard implementation approach using a tested framework greatly reduces eCITES project’s risks and costs and achieves improved results and synergies at the regional and global level. The Framework was developed by experienced project managers taking into account lessons learned from similar eGovernment projects around the world. Each pillar of the Framework is a sub-project with defined outcomes and benefits. Parties can implement eCITES pillars in a stepwise approach and according to its own readiness. The development of eCITES solutions is costly and involves the typical project risks associated with ICT development projects. As many CITES Management Authorities are still lacking automated systems the Secretariat worked with the UNCTAD ASYCUDA project to provide Management Authorities with the option to choose a readymade system for their eCITES project. 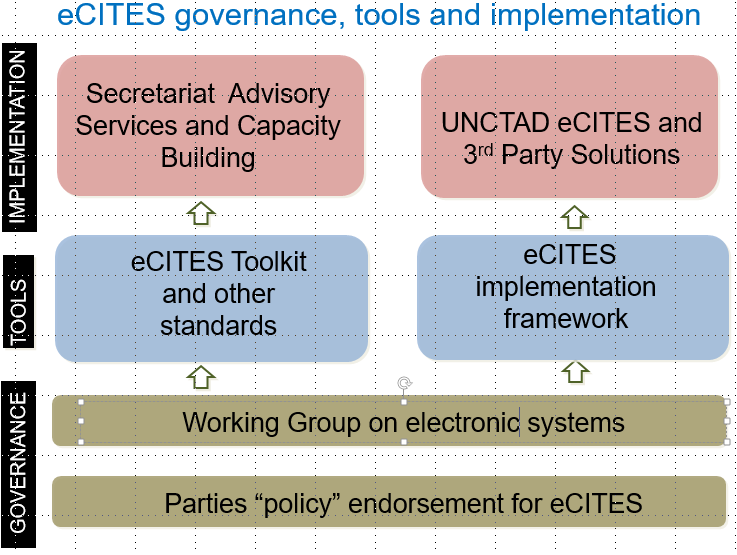 The UNCTAD eCITES system is an off-the-shelf software solution for Parties that want to implement eCITES. The system provides automation of all four pillars of the eCITES Implementation Framework. The eCITES system is built on the UNCTAD ASYCUDA technical platform, an electronic system used by nearly 100 customs organizations around the world to manage customs export and import control and clearance. ASYCUDA eCITES is fully based on open, international standards for trade and electronic business defined inter alia by the International Organization for Standardization (ISO), the World Customs Organization (WCO), the United Nations Centre for Trade Facilitation and Electronic Business (UN/CEFACT) and the World Trade Organization (WTO). It is fully configurable to national legislation and workflows and can exchange standard based electronic messages with other systems such as the national Single Window or the customs data management system. The software is provided free of charge and includes source code to develop national extensions. The system is implemented through a joint technical cooperation project between the country and UNCTAD. This project includes CITES management support, national adaptations, redesign of business processes, capacity building and initial operations support. For the operation of the system two models are available. The system can be maintained in and by the implementing country. Alternatively the country can ask UNCTAD to host and maintain the national eCITES system in UNCTAD’s Centre of Excellence in Gibraltar. The Convention establishes a system of Permits to regulate trade in endangered species listen in the three Appendices of the Convention. Article VI of the Convention focuses on permit requirements. 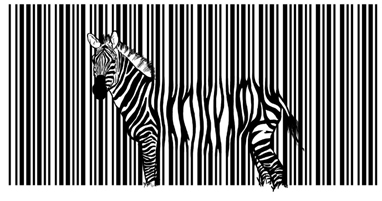 Article VIII requires Parties to send permit information in their national reports on CITES trade to the Secretariat. Provides detailed recommendations and specifications for CITES permits and certificates. It establishes the equivalent of paper and electronic permits, recommends business processes for permit issuance and exchange, use of international standards, authentication and signatures, data semantics and code lists. CoP Decision 15.54 encourages parties to use the CITES electronic permitting toolkit. Annex 2 of Resolution Conf. 12.3 (Rev. CoP17) provides several standard forms. The CITES electronic permitting toolkit provides standards for electronic CITES permits, in particular data model and Schema for electronic CITES permits based on UN/CEFACT Core Component Library it’s mapping to the WCO Data Model. The CoP recommends Parties to apply to the toolkit. The toolkit can be downloaded as PDF. Describes structure, data elements, codes and the format of annual reports. As the information in an annual report is a subset of the data contained in the CITES permits this document also provides further specifications for data to be used in CITES permits. Requests Parties to inform the Secretariat regarding planned and ongoing projects related to electronic systems for CITES trade. Requests the Standing Committee to re-establish the Woking Group on Electronic Systems and Information technologies and provides the terms of reference for this group. Requests the Standing Committee to monitor progress of implementation of electronic systems and the work of the Working Group and provide recommendations and suggestions for revision of Resolution Conf. 12.3 (Rev. CoP17) and Resolution Conf. 11.17 (Rev. CoP17) to the 18th meeting of the Conference of Parties as deemed necessary. Requests the Secretariat to publish information on planned and ongoing projects of Parties on its website, to liaise with Management Authorities, donor agencies and other stakeholders and to provide capacity building and advisory services. Briefing paper for decision makers; Summarizes eCITES tools and instruments. Available from the Secretariat. Provides national project managers with a best practice approach to plan and manage the automation of their CITES processes. Available from the Secretariat. An eCITES off-the-shelf software solution available to Parties.. UNCTAD makes the system available to Parties in the framework of a technical cooperation project. UNCTA eCITES provides full automation of all CITES permitting processes including automated risk management, electronic payment, Customs data exchange and electronic reporting. Web portal to validate a CITES XML permit against the specification of the ePermitting toolkit. The portal will return a technical compliance assessment.